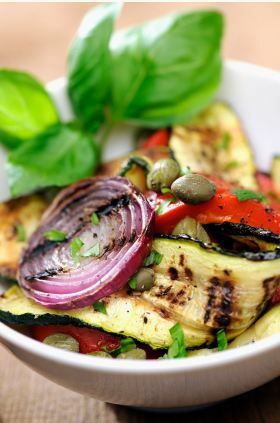 Life's Tips and Tricks: Grilling Vegetables.....A Healthy Option? I am now contemplating whether to continue buying meats from a local market here near our apartment. I am just thinking about issues on sanitation. As we are living on a village a bit far from the city, we don't have any options but to get our food supplies from a local market nearby. There is no problem buying fruits and vegetables of course, but I am just a bit worry about the meats. Because of this, I am thinking of becoming a vegetarian. :) Well...at least when I'm here. (lol) I know it's hard to get away with meats but I just thought of having meat servings only after I do my grocery shopping where I could buy fresh meats. So that I would be eating meats for just about a week after my grocery shopping. Then after that, I'll go back to consuming vegetables and fruits only. It might be a sound idea but I'm not so sure if it's workable. I've read recently that grilling vegetables is a healthy option of cooking vegetables for your meals. Aside from the fact that it can diversify your menu, this could retain the flavor of the veggies, as well as their vital nutrients. It's always best to eat vegetables closed to their natural flavors and that's what grilling your vegetables can lead you to. We can choose to marinate our veggies too, if we want to add more flavorful taste. Grilling time would normally be about 4 to 5 minutes and can be done using a gas or charcoal grill. Your choice! Corn, potatoes, carrots, eggplants, cabbage, onions, tomatoes, mushrooms are all good for grilling and incorporating this into our daily diet would keep us fit and more energetic, not to mention that it would be a lot cheaper, too. Knowing these benefits, I might consider doing what I've planned....After all, I want a healthier me! I love eggplant and corn to be grilled.